128 p., 15,5 x 23 cm. 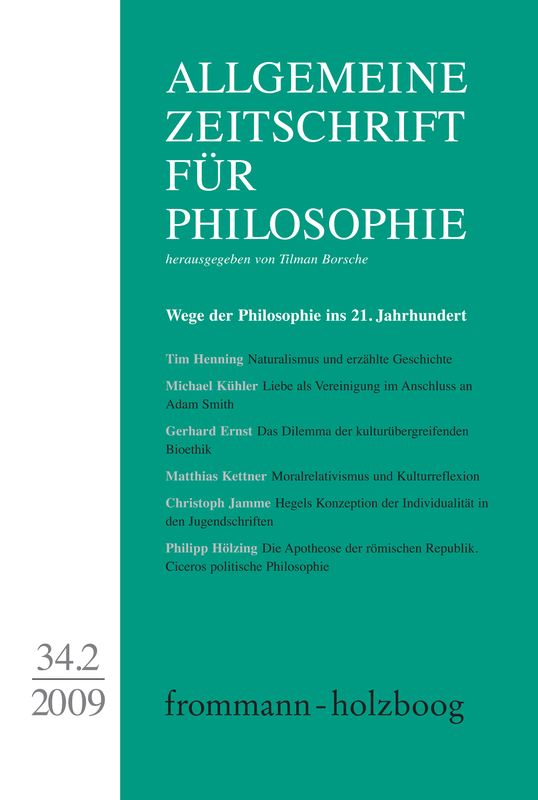 With contributions by Gerhard Ernst, Tim Henning, Philipp Hölzing, Christoph Jamme, Jens Kertscher, Matthias Kettner, Michael Kühler and Dirk Quadflieg. This paper describes a problem of naturalism and it shows that in order to solve it, naturalists need a conceptual tool from the domain of the humanities, namely narrative. I start by defining a certain class of properties that I call historical properties. Then I argue that it is difficult to justify an adequate naturalistic supervenience claim for these properties. This difficulty can be overcome only by introducing certain functional reductions. Historical properties can be defined by reference to their roles in certain narratives; on the basis of such narrative definitions, one can try and find natural surrogates that actually play these narrative roles. Thus, naturalists can construe the historical aspects of reality as those natural aspects about which certain stories can be told. The punch line is: It is precisely the naturalist who will have to keep telling stories, if he is to come to grips with historical reality at all. Using A. Smith’s Theory of Moral Sentiments as a starting point, the idea of love as union is explained as a »harmony of sentiments« between lovers, voluntarily achievable through the »amiable« virtue of »humanity«, i.e. empathy. Next, some obvious objections are discussed, for the presented notion seems to blur the distinction between love and friendship as well as to undermine the lovers’ autonomy. These objections make it necessary to go beyond Smith’s account and to bring into view the impact a union-view has on the identity of lovers. Contrary to friendship, love as union consists in sharing all what one – in H. Frankfurt’s identity constituting terms – cares about, including the union itself. Furthermore, as the resulting modifications of the lovers’ identities depend on the virtue of »humanity«/empathy, they are, at least indirectly, autonomously acquired and, thus, pose no threat to autonomy. Different cultures disagree strongly on the nature and importance of central moral values. We encounter many examples of such disagreement in issues of bioethics. Is moral relativism therefore true, or is it rather the case that whole cultures are fundamentally wrong about many moral questions? Both options seem to be unattractive. The aim of this paper is to answer the question of how to react properly to both our relativistic and our anti-relativistic intuitions concerning bioethical problems. I first draw a distinction between metaethical and normative relativism, and then go on to formulate the foundations of a form of normative relativism in which a legitimate plurality of moral views is accepted without exempting them from rational criticism. I employ an analogy between individual decisions and cultural decisions and developments, and I draw on results of empirical value surveys. The practical consequences of my position are illustrated with two examples. The article discusses the problem of moral relativism and of a neutralist stance in metaethics. It focuses in particular on the suggestions developed by Gerhard Ernst in his preceding article on the dilemma of a transcultural bioethics. It argues that Ernst’s metaethical objectivism serves little to clarify the problem while his normative relativism leaves us at a loss in the conflicts we face in transcultural debates concerning bioethical problems. The history of culture is a process of progressive individualisation. The article examines Hegel’s role within this process, especially regarding his early writings before 1800. First the author discusses Hegel’s theory of love, then speculations on the notion of the »individual« in the so-called »Systemfragment« of 1800. Cicero’s political philosophy has gained little attention for a long time. In recent years, however, there has been a discussion in political philosophy about a »Neo- Roman republicanism«, which is then differentiated against a Greek »civic humanism«. Starting from this discussion, this essay seeks to explore how the Roman republicanism of Cicero relates to it. Its central claim is that, in contrast to the recent discussion, we find in Cicero a combination of republicanism and civic humanism which lead to his apotheosis of the Roman republic. Jens Kertscher: Heidi Salaverría, Spielräume des Selbst.